If done correctly, losing a lot of weight in the days leading up to a weigh-in can give you a huge advantage 24 hours later when you step in the ring to fight. 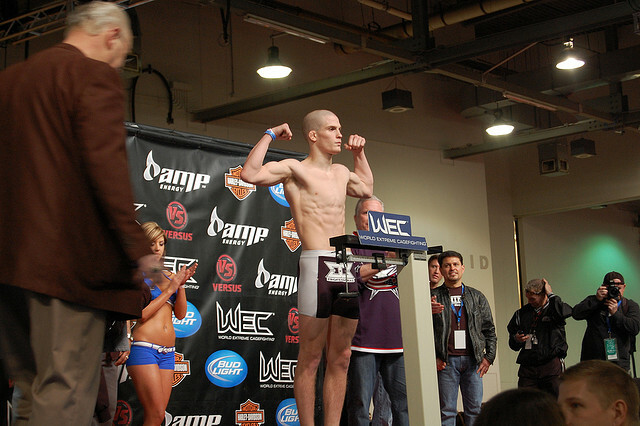 It is not uncommon for a fighter to weigh 20-30lbs less at the weigh-in than he or she does when the fight starts 24 hours later - and if all goes to plan - the boxer or fighter will have just as much energy and power on fight day as they did before cutting weight. Weighing 10, 20 or 30lbs more than your opponent means a lot in a fight. I must point out that this quick way to lose weight fast is only going to give you an advantage in the ring if your weigh-in is at least 24 hours before your fight. Amateur boxing matches usually schedule the weigh in the same day as the fight - precisely to try and avoid this type of weight manipulation - and that does not provide you enough time to put the weight back on that you lost or re-fuel your muscles to give you an advantage in the ring. If you do use this extreme weight loss method you will fight in a much weaker state than if you had just weighed in at a heavier weight. Make no mistake about it - the method described here for losing weight fast is all about draining your body of as much water as possible - to a point of almost severe dehydration. It has very little to do with fat loss and will leave you weaker, energy less, and cranky. You will not be pleasant to be around. And if you take it too far - you can kill yourself. So don't be stupid. The practice of cutting weight before fights is a phenomenon that lives on in the boxing and fight world as boxers and fighters search for any and all advantages over their opponents. For some - it is simply to ensure the fight goes on by staying in their weight class. But to be crystal clear - losing weight this fast has no place in a healthy, sustainable lifestyle. If you follow this protocol you will lose a lot of weight really fast - but it's all water. As your body is mostly water - the quickest way to lose weight is to get rid of most of that water. Over the course of five days, you'll push your body into a state of dehydration. At the peak of the protocol you'll have lost anywhere from 15-30lbs and then you'll put it all back on in the next 24 hours. Do NOT try to maintain your new weight - the only reason to do this is to hit a weight class target at a specific time. It is not a general purpose weight loss plan. As soon as the weigh-in is over you will re-hydrate immediately and all of the weight you quickly lost is going to come back even quicker as your body absorbs every drop of water you give it. So - if you think you are going to follow this protocol to cut the fat off your abs - you're out of luck. There are better, safer, and easier ways to do that that won't make everyone around you want to kill you. Start limiting water intake. On the first day you'll drink a lot more water than usual which will tell your body to hold onto whatever sodium it has and get rid of its potassium. You'll start flushing out water and then as you start decreasing your intake - the increased levels of sodium proportionate to the water in your body will continue to draw water out of your cells for excretion. D Day - no water until after the weigh in. Limit carbs to less than 50g per day. Eating carbs will bring water into the body and will replace muscle glycogen. By limiting your carb intake you will continue flushing water while also depleting glycogen stores in your muscles. This is what is going to really affect your mood as your brain runs on the glucose that carbs provide. Eat proteins and fat. You have to eat - so where you are limiting carbs - replace them with high quality proteins and fats2. Lots of meat and veggies. Avoid all salt. Salt will absorb water and try to keep it in your body so the more you have in you, the harder it will be to keep the flushing going. Sweat a lot. This is where the pictures of garbage bag clad boxers sitting in saunas comes into play.I wouldn't recommend that, but you do want to sweat out as much as you can. Quickest and easiest way to sweat is to take super hot baths where you submerge every part of your body (less your nose) for 10 minutes at a time. You sweat when it's hot, but you sweat a lot more when its hot and humid. The bath prevents your perspiration from cooling you off so it accelerates the sweating. Then one to two days before the weigh-in you start sitting in the sauna as well to put the finishing touches on your rapid weight loss. A natural diurectic. If you're getting close to the weigh-in and are still 1-2 lbs over weight, you may want to consider a diuretic like dandelion root that will help expel even more water. Dr. John Berardi of Precision Nutrition used Nate Green as a test subject to refine this super fast weight loss method for boxers and fighters. You can download the nicely summarized, step-by-step, day-by-day weight loss plan. If all went well and you're still alive then immediately after the weigh-in you need to put back on the weight you lost so you get that advantage you were looking for and also so you get back all of the power, strength, and energy your deflated body no longer has. Your body can only absorb about 1L (2.2lbs) of water every hour - so you don't want to go over that amount. Given that you have about 13 hours before the fight - you can theoretically put back on about 28lbs (via 13L of water). However, only about 75% of that 1L you drink every hour will be retained - you'll piss out the rest - meaning it will be closer to 22lbs that you put back on. That takes care of the water - but you also need to replenish the glycogen in your muscles - so belly up to the buffet and start eating. Eat as many carbs (proteins and fats) as you want, but keep it healthy. Loading up on junk food isn't a great idea. Your body will pump all that glycogen back into your muscles filling them out. You'll get a hell of a mood boost and suddenly feel like you can take on the world - perfect for stepping into the ring. So you just learned the secrets of how boxers and fighters lose a lot of weight really fast. It's by far the quickest way to lose weight and it's also the stupidest. You don't need to do this unless you're a professional fighter and need that weight advantage in the ring. So while knowledge is power - this knowledge is also dangerous. Use it wisely. Then once you hit the target - rehydrate and replenish your fuels by drinking 1L of water per hour and eating as many clean carbs, proteins, and fats as you like.